The patented Hen Holster combines a comfortable harness design with a well-fitting diaper that contains a leak-proof, reuseable inner pocket. 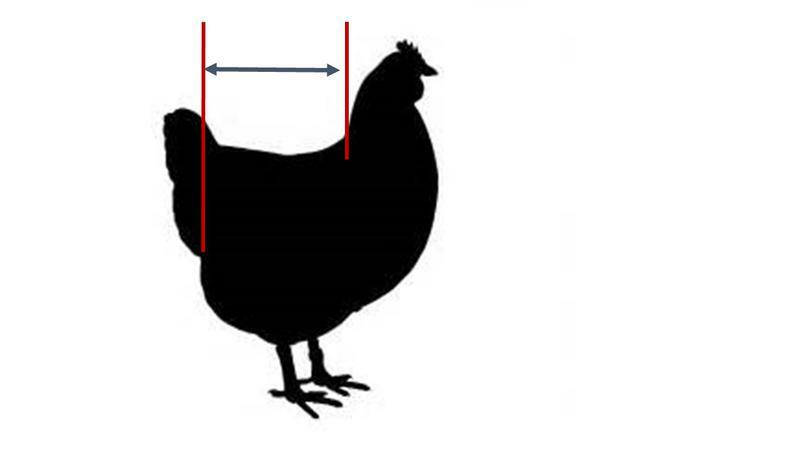 The shape of the Hen Holster channels droppings away from your bird, even when your pet is perching or lying down. 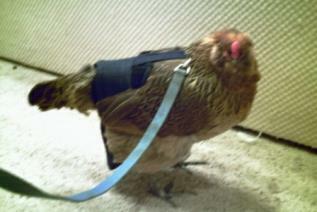 The D-ring on the back enables you to easily connect a leash to take your chicken for a walk. AVAILABLE IN TWO WRAP-AROUND STYLES: a standard style with a permanent soft, flexible sewn-in liner and a MADE-TO-ORDER version that comes with two sturdy removable vinyl liners. Both are comfortable harness-style diapers available in three sizes to fit most chickens, ducks and geese. 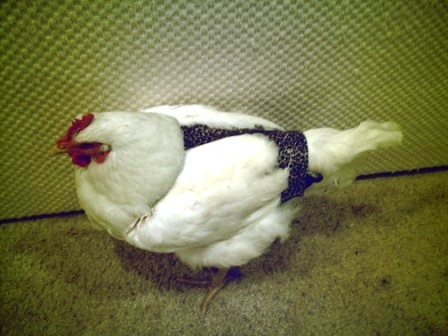 The Hen Holster solves the problems typically encountered with bird diapers: incorrect fit, uncomfortable fit, poor quality fabric, inferior construction, leakage, complicated to put on and take off, difficult-to-change liners. 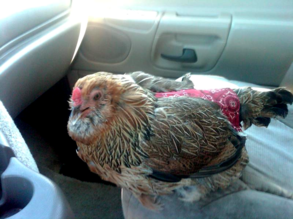 The Hen Holster doubles as a harness! 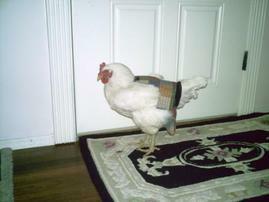 Want to take your pet outside for a walk? Just snap on a leash and go! 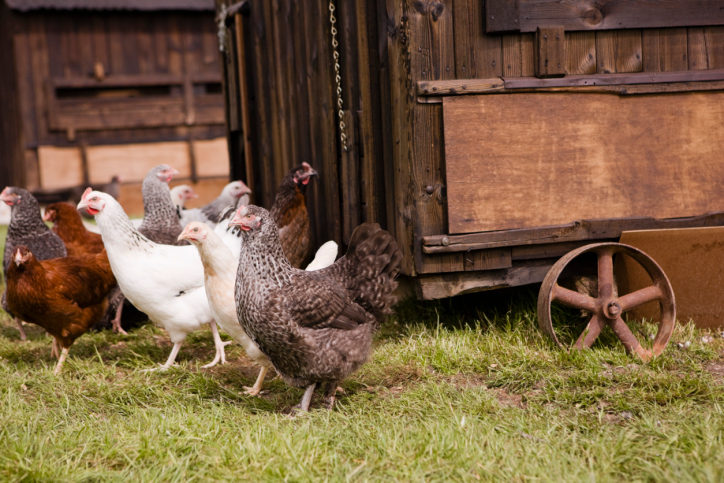 Have (or want to have) an indoor free-range chicken, duck or goose? 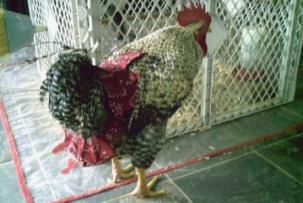 Our patented Hen Holster bird diaper is for you! "My students and I did a hatching project this year and 3 egges hatched. Everyone bonded and the idea of giving up our chickens just didn't work with my students. I needed something that would allow our babies to grow up in a classroom and these diapers worked! I got the small size first for when the chicks where growing up and now I'm getting the large. I wouldn't think to get any other kind than your wrap-around harness. My students can take them on walks during recess and teachers request that they come to classrooms during science lessons. These diapers have allowed my chickens and me so much access. Plus they are so easy to clean and keep up with. I really love them."